Cape Town – Finance Minister Malusi Gigaba told Treasury staff to “forget all the noise outside” as he believes the negative reaction to his appointment will pass. The former Home Affairs minister’s statement comes as Save SA continues its “occupation of Treasury” outside his headquarters in Pretoria on Church Square and following rating agency Standard & Poor’s downgrade of South Africa’s sovereign bonds to non-investment grade, or junk status.“Forget all the noise outside. Do your jobs. What you see and hear will pass. Change brings with it such anxieties,” Treasury quoted him as saying on Twitter on Tuesday. 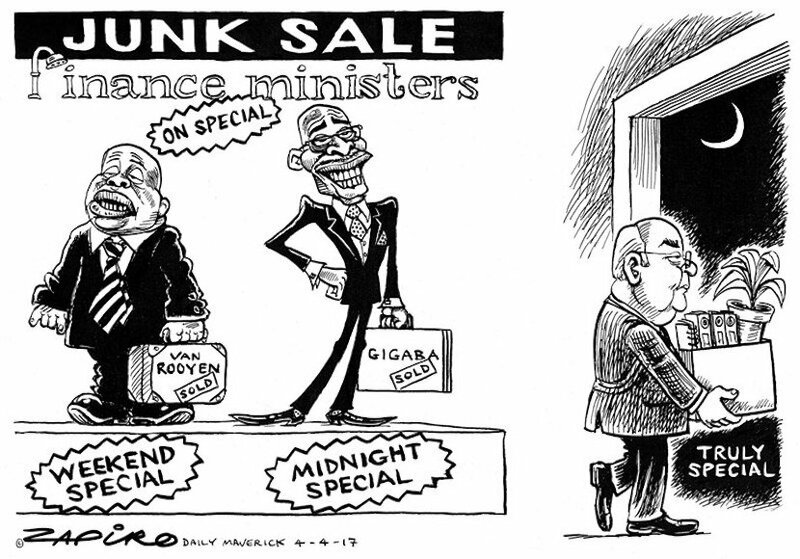 More of Zapiro’s magic available at his website www.zapiro.com. His speech occurred in front of staff, who were gathered in the old Reserve Bank building in Pretoria to hear their new leader’s vision for Treasury. Staff sat cross-armed and silent, a stark comparison to their singing of “Senzenina”(What have we done) and the national anthem in the very same room on Friday, as former Finance minister Pravin Gordhan and his deputy, Mcebisi Jonas, were about to address them. Ever since Nhlanhla Nene was fired as their minister in 2015, civil servants at Treasury knew their strong ideals and ethics would once again be challenged with a leader that may bring a different set of ideals. The rise of the narrative of “radical economic transformation”, the proposed nuclear deal and the perception of Treasury being a “Dr No” adds to this uncertainty. Pretoria – New Finance Minister Malusi Gigaba says he has met the Gupta family, but that they have no influence on the decisions he takes. Gigaba was speaking at a press briefing following Standard & Poor’s (S&P’s) decision to downgrade South Africa’s credit rating to junk status. It was revealed on Fin24 that Gigaba’s new advisers at Treasury have controversial backgrounds, with one having alleged links to the Guptas. Responding to a question by Fin24 on his relationship with the Gupta family, Gigaba said that he has no relationship with them. He said that he has visited the family, and celebrated Diwali with them, as he has celebrated other religious events hosted by other people at their homes. “But these things do not impact on my ability to take decisions,” he reiterated. In court papers this year, the Oppenheimers accused Gigaba of being influenced by the Guptas over their luxury international airport terminal in Johannesburg, Fireblade. It’s an allegation Gigaba denied in court. The South African Communist Party believes Gigaba was selected solely to do the Gupta family’s bidding at the Treasury. 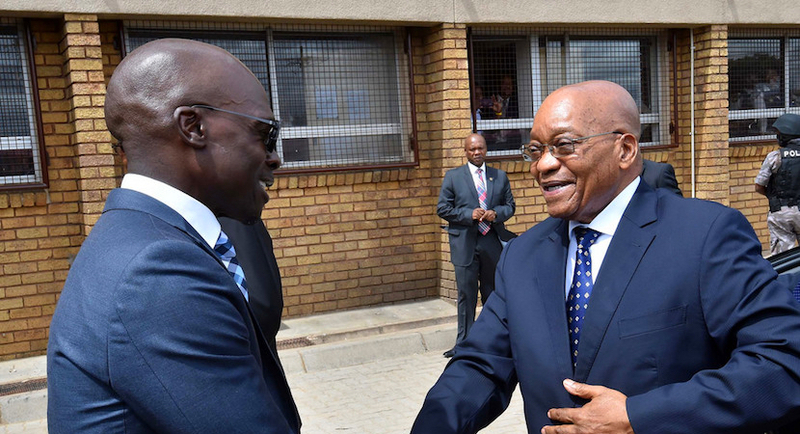 File Photo: Home Affairs Minister Malusi Gigaba welcomes President Jacob Zuma upon arrival for the launch of Desmond Tutu Refugee Reception Centre in Pretoria, 17 Feb 2017. “The Guptas have almost, now with the removal of [Finance Minister] Pravin Gordhan, ensured that they have unfettered access to the resources at Treasury,” SACP second deputy general secretary Solly Mapaila said on Friday. The Guptas have close ties to President Jacob Zuma. They have been accused of having undue influence over his appointment of ministers and the running of state-owned enterprises. Save SA also said Zuma’s reshuffle was a Gupta coup, especially as it resulted in the removal of former finance minister Pravin Gordhan and his deputy Mcebisi Jonas.